Suffolk Parade was laid out before 1820, when it featured on the Post Office map of Cheltenham. This house may have been built as early as 1814, which would make it one of the oldest in the street, and in 1825 it was described as a "snug little cottage". Even today it is certainly smaller than the neighbouring houses. By 1830 Mr James Gwinnell, a plasterer & bricklayer, lived here. After that no trades are listed for this property for many years, indicating that it remained in residential use. In 1861 Mr E. Felstead was a lodging house keeper here and in 1875 Mr W. Felstead, a butler, lived here. 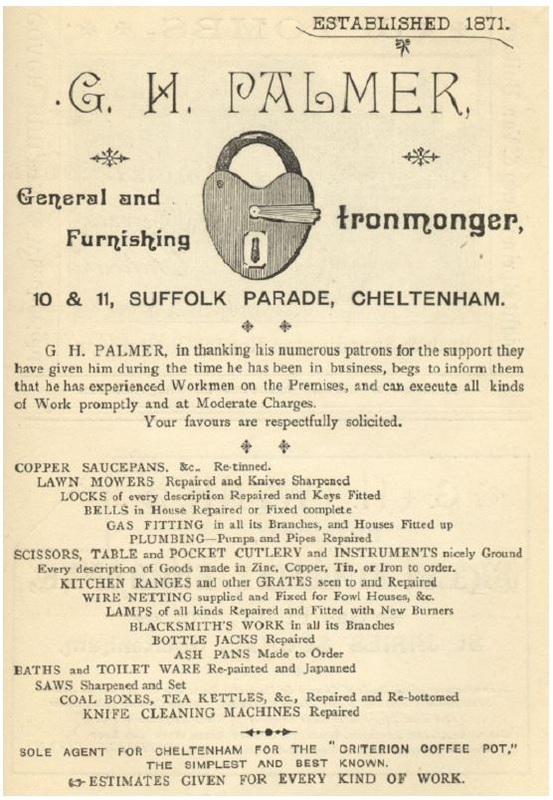 By 1881, the property saw a complete change when it was combined with number 11 next door (now number 27) to become George H. Palmer, Ironmongers. Mr Palmer was also at 23 Suffolk Parade, which appears to have been his home at that time. He was still here at number 26 in 1895 but by 1900 it had been taken over by Mr C.H. Barcham, who remained until 1922. In that year he sold the business to Percy E. Jeffcoat in whose hands it belonged until the late 1950s. For a period in the 1960s and 1970s F. Hulin's shoe shop traded here, carrying out repairs, and the property belonged to John Blunt, the owner of the Daffodil at that time. In 1983 George Schwaben bought it when he relocated The Copy Shop to here from the Rotunda buildings in Montpellier Street. He founded the company in 1969 to provide technical author services and it has since evolved to specialise in copying and printing.